Is Google Showing Fewer Ads Per Search? Columnist Mark Ballard explores both first- and third-party data to help understand what's really driving Google's paid search impression decline and weakening click growth. Google’s Q1 2015 earning report showed that paid clicks on Google websites were up 25% year-over-year, while average cost-per-click (CPC) on Google websites was down 13%. Unfortunately, these data points tell us almost nothing about the state of Google paid search. This story fits much better with the paid search trends that a number of industry analysts, including myself, have been seeing — and it’s nice to finally have some clarity on why Google has been reporting hefty CPC declines when so many industry data sources have been showing the opposite for Google paid search. The shift to mobile as an explanation for declining CPCs was a red herring in recent years, and foreign exchange rate effects could only explain so much, but now we know that YouTube ads are big enough to drop the officially reported growth rate of Google sites CPCs by at least 13 percentage points. There are plenty of companies that release reports with data on the paid search industry, and while each of these reports may be subject to its own flaws and biases, taken together, they can shed light on the underlying trends that are affecting all of our search programs. The data for Q1 2015 has been more consistent than usual on one key point: Google paid search click growth was weak even as click-through rate (CTR) rose. iProspect reported that Google clicks were down 11% Y/Y as impressions declined 35%. IgnitionOne showed clicks up 4% across all search engines, but with impressions down 20% and CPC up 21% (23% for Google). The Adobe Digital Index shows Google spend down 1%, even as CPC rose 6%, suggesting a decline in clicks of nearly 5%, despite CTR rising 18%. In the latest quarterly report from my company, Merkle RKG, we show Google click growth at 0.2% Y/Y in Q1 as CPCs rose 13%. Impressions were falling 18% Y/Y by the end of the quarter. While factors like the default search provider change for Firefox, slowing tablet growth, and the maturation of the PLA market contributed to slowing overall growth, they do not explain it fully. Maybe all of these reports are “wrong,” and there is some reason our data isn’t a good reflection of the true underlying trends in Google paid search; but after digging into this question in recent weeks, I’m convinced that there was a significant change in the AdWords market that began to take hold in mid-2014. The bottom line is that Google may actually just be showing fewer ads, even when accounting for the shift from text ads to Product Listing Ads (PLAs) and from desktop to mobile. This notion runs counter to the popular narrative that the Google SERP has become increasingly overrun with ads, but a number of data trends are pointing in this direction. Google’s incentive for such a change would be to drive a higher percentage of ad clicks to the ads at the top of the page, which yield them higher CPCs. Showing fewer ads wouldn’t be that different from what they’ve done over the years with the numerous ad extensions that are available and preferentially served for top ads. Looking into AdWords impression trends, my colleague and fellow Search Engine Land columnist Andy Taylor and I found that Google.com non-brand text ad impression growth in June 2014 was 19% Y/Y for the median AdWords program managed by our company. The next month, growth fell sharply to 7%, and by October 2014, impressions were declining by 12% Y/Y. By March 2015, impressions were declining by 18% Y/Y. We looked specifically at Google.com results to take search partners out of the equation. Other industry sources have pointed to declining search partner impressions as a reason for overall Google declines, and I originally believed this was the most likely cause for the declines we were seeing. Notably, eBay moved its mobile search ads from Google to Bing in mid-2014; this had an appreciable impact on overall AdWords search impressions, but the impact to clicks was minor. We also wanted to isolate desktop results, because factors specific to our data set led to above-average growth for mobile traffic in Q3 2014. We do not believe that desktop traffic was impacted at the same time by similar factors. Importantly, while traffic has been shifting to both mobile devices and PLAs over time, the timing and severity of the deceleration in desktop text ad impression growth does not match up well to what has been a steadier and slower shift to those segments. Similarly, another consideration here is Google making close variant matching mandatory back in late September 2014. This could have led to increased competition for any given query and driven impressions for our programs lower. We do see impression growth drop sharply in October 2014, but the timing of changes in other data points, and their directional movement, does not fit this picture well. As Google impression growth stalled and ultimately fell into decline, we saw a concurrent rise in average Google first page minimum bids. Using March 2013 as a baseline, we see first page minimums for non-brand text ads roughly double by July 2014 after being stable if not down slightly into early 2014. First page minimums increased further as we entered the holiday shopping season, but they have remained greatly elevated into early 2015. 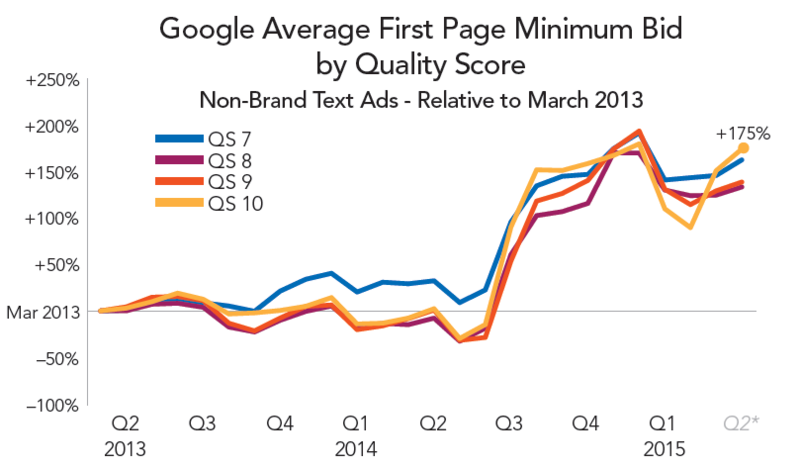 We see similar trends for ads across all Quality Score levels with significant traffic. We would expect to see this type of trend if Google began showing fewer ads per result, competition increased significantly, Google began showing fewer ads for less competitive queries, or Google simply raised minimum bids directly. It’s difficult to rule out any combination of these factors, but average position trends can point us to more likely scenarios. In the last year, our average position for a non-brand Google text ad has moved up the page by about half of one position for the median program. Again we see a major shift occur in the second half of 2014 following stable results in the earlier part of that year. Were increased competition a major factor in driving down impressions and pushing up first page minimum bids, this result seems unlikely. Short of Google itself weighing in to explain the paid search impression decline and weakening click growth that so many of us are seeing, we’ll have to rely upon more circumstantial evidence to figure out the extent to which forces beyond our control are shaping the paid search market. Unfortunately, on the Google earnings call, Patrick Pichette declined to elaborate when questioned about search trends specifically. This isn’t just idle curiosity, though. If there is external pressure pushing up CPCs and driving down impression and click growth, but advertisers are not aware of what is really going on, they may be prompted to take action in ways that are not helpful — or even harmful — to their search programs. While no two search programs are alike and each is impacted by a unique combination of factors, having a decently accurate sense of larger industry trends can provide much-needed perspective and context to those individual experiences. At least, I’d like to think so. I’m curious what the readers of this site think about the data I’ve presented here. Does our take sound off base? Mark Ballard is the Vice President of Research at Merkle. He manages and writes for the popular Merkle Blog and heads the production of Merkle's quarterly Digital Marketing Reports, which cover Paid Search, SEO, Display, Social Media and more. Mark's time at Merkle has included building and managing paid search programs for clients in the retail, finance, B2B and automotive sectors.